1999: 65-90-87 = 242 points (30th). 1988: 93-75-85 = 253 points (19th). 1997: 73-92-70	= 235 points (15th). 1996: 100-92-84 = 276 points (14th). 31/08/1996: 88-92-96 = 276 points (5th). 01/06/1996: 98-97-87 = 282 points. 1995: V1 - CAC in Westrich, VDH-Anw., CAC-Reserve. 1994: V2 - Landesgruppen Show Nordrhein in Essen. 1994: V2 - CAC in Mönchengladbach. Overall Build: Powerful; masculine; dense short soft fur; light tan; good markings; strong head; sufficient underjaw; eyes dark-browm; back long and firm; good croup; good front and rear angulation; balanced gaiting with good overall firmness. Nature: Open and sure. Very high protective instinct and fighting spirit, very high courage and hardness with middle sharpness. Ningicosan von der Weyermühle placed 19th at the IDC Weltmeisterschaft in 1998 with 253 points and passed the Körung 'for Life' with highest possible rating for working drives, courage and hardness. His sire, Hertog Conan van Manensheide, was the winner of the D.V. Meisterschaft in 1993 plus winner of numerous show titles and passed the Körung 'for life' with highest rating for working drives. Ningicosan lived to 7 years of age; his sire lived to 7 years of age with the cause of death being Bloat and his dam, Gina von der Weyermühle, passed away at 8½ years of age from cancer. Qastra: SchH 3, FH and dam of the Ascomannis “A” litter (Gitano, Gina) and Germania “A” litter (Arrex, Anja, Anushka). Badhita: IPO 3, FH and passed the Körung with Körklasse 1A rating. She is dam of the vom Burghof “A, B” litters (Ascan, Akascha, Aycka, Bosz, Bugatti). Chakko: IPO 3, FH, DV-DM participant, IDC-WM participant and passed the Körung with Körklasse 1A rating. 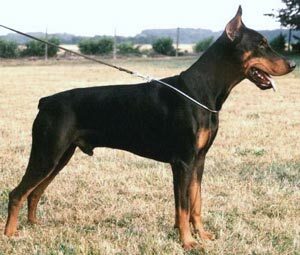 He is sire of the von der Zonser Heide	“G” litters (Gina) and von der Scheltheide	“G” litters (Granat).